While gun violence grows more common by the hour, students nationwide are taking a stance and fighting back. Sparked by the devastating Parkland, Fla. shooting, a group of students from the Marjory Stoneman Douglas High School have started a revolution. 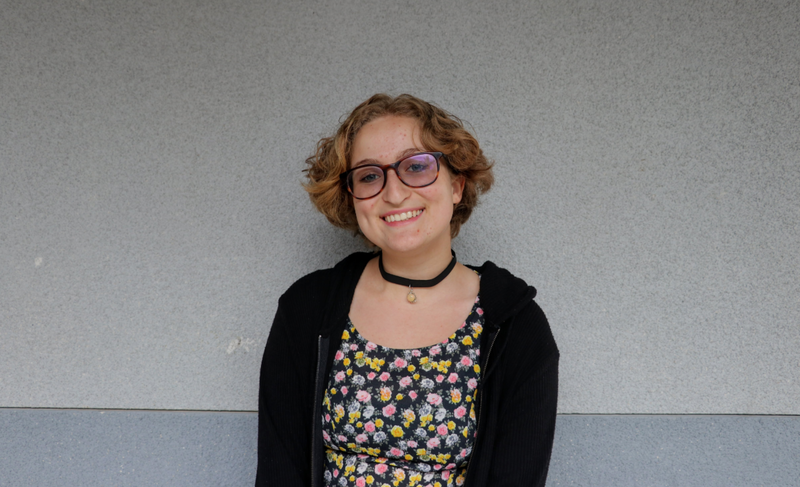 These students have created guidelines that sophomore Hannah Yale is using to organize two different walkouts for Foothill. She hopes the walkouts will raise awareness about the issue of gun violence in America. 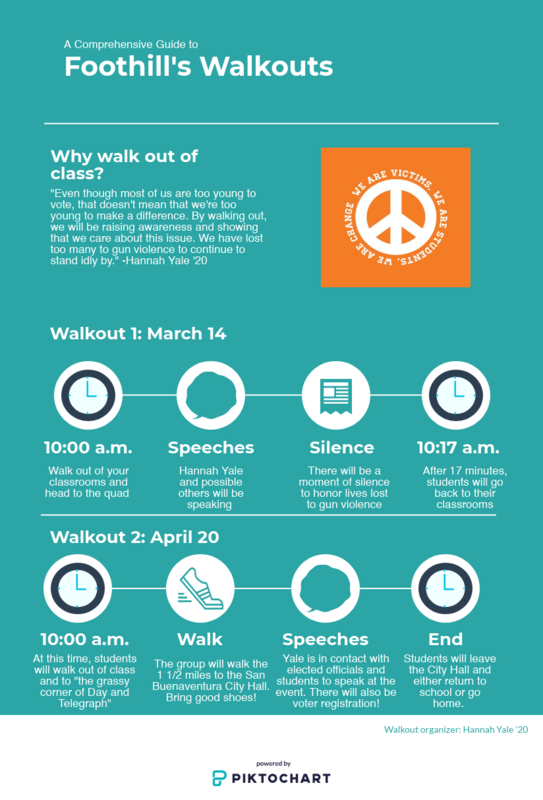 The first walkout occurred on March 14 beginning at 10 a.m. It will last for 17 minutes to honor the 17 lives lost in the Parkland shooting. Students will gather in the quad to hear a short speech from student and walkout organizer Yale. According to Yale, there will be “a moment of silence for those we have lost.” The purpose of this walkout is to stand in solidarity with student who advocate for gun control around the world. Principal Joe Bova confirmed that “as long as students stay on campus” there will be no repercussions for students who choose to participate. April 20, 2018 will be 19th anniversary of the Columbine shooting, which Yale called “the first drop of water in what is now an ocean on school shootings.” There is a second walkout planned for this day. Foothill students will have the chance to participate in a walkout that is being facilitated throughout the nation. Students will leave their classes at 10 a.m. and meet up “on the grassy corner of Day and Telegraph,” said Yale. Then, students will begin the march to the San Buenaventura City Hall. Though the complete schedule is not yet decided, there will likely be speeches from different students. Yale said she is “currently in contact with local members of government as potential speakers.” She also said there will be voter registration set up. This walkout provides a chance for Foothill students to take part in a nationwide event while still making change in the community. The intent of walking all the way to City Hall is to show representatives that students are serious about demanding gun control. Students walking out won’t return to school for the rest of the day, and some serious students around the nation have decided to walk out of school and not return until Congress passes harsher laws surrounding gun control. Students planning to participate in this particular walkout are subject to the same consequences they would be had they walked out of class and not returned on any normal day. The school considers any absences not due to illness, appointments, death, court or religion unexcused. It is up to each student to decide whether the walkout is worth it to them. The Gun Lobby rules America. It’s God is the Gun, because it earns billions by making them and selling them to poor ignorant idiots all over the world — ranging from ‘Defence’ ministries to terrorists. It is the West’s discovery of the Gun that enabled it to enslave countries much more developed than them spiritually and mentally, but having no guns to fight back. The guns replaced bravery and valour as desirable qualities Even a coward with a gun can kill a person of courage. The Gun has the final argument. A dumb idiot with a gun can kill the most intelligent person. The dead cannot argue…or convince. Some idiots do believe that guns prevent violence and that if there are no guns mankind would be using some other weapons to continue killing. That means they do not believe in Darwinism or think humans can evolve into thinking beings which can convince the rival by argument, not force. Said Shankar, who traversed a sub-continent from North to South and East to west TWICE on foot before his death at 34 years, re-established Hinduism by CONVINCING the rival thinkers as Hinduism believes in rule through consensus and not 51:49 majority of Western democracy. The Gun Lobby thinks shooting down the dissident would have been much easier.